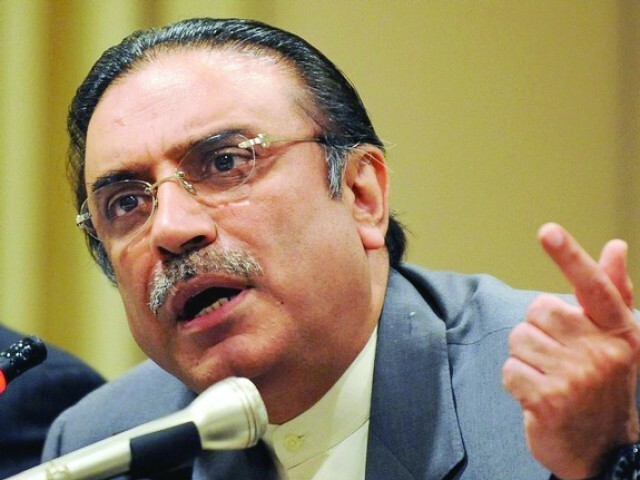 President Asif Ali Zardari said on Wednesday that Pakistan Muslim League-Nawaz (PML-N) chief Nawaz Sharif has denied his request for a visit. The President had intended to visit the rival party chief in order to condole the death of the latter’s brother Abbas Sharif. Talking to visitors at Bilawal House, Lahore on Wednesday, President Zardari complained Nawaz denied him a visit despite owing his life to him. He claimed he had saved the PML-N chief from being hanged by former president Pervez Musharraf. President Zardari maintained that he became ‘friends’ with Nawaz after the latter was imprisoned by Musharraf following the 1999 coup. He claimed that at the time, Musharraf had been pressuring Justice Rehmat Hussain Jafri to severely punish Nawaz. “I had some acquaintance with Justice Jafri, and when I heard Musharraf was pressuring him into punishing Nawaz, I advised him to settle the case only on merit,” he said, adding that he was successful in convincing Justice Jafri against announcing capital punishment for the PML-N chief. President Zardari also claimed responsibility for PML-N’s success in Punjab in the 2008 elections, saying Nawaz had intended to boycott the polls before he convinced him to contest them. He also claimed that PML-N got votes under the banner of reconciliation with Benazir Bhutto. President Zardari has finalised the list of Pakistan Peoples Party (PPP) candidates for National Assembly (NA) seats from central Punjab and has constituted a parliamentary board within the party for awarding tickets to PPP aspirants across the province. According to sources, the board comprises former premier and PPP vice chairman Yousuf Raza Gilani, MNAs Imtiaz Safdar Warraich and Faryal Talpur, PPP central Punjab president Manzoor Ahmad Wattoo, Leader of Opposition in the Punjab Assembly Raja Riaz and Senator Jehangir Badar. President Zardari and PPP chairman Bilawal Bhutto Zardari, meanwhile, have urged party office bearers in districts across Punjab to submit reports to the party’s newly constituted parliamentary board so that it may finalise the tickets for the elections. Former prime minister Gilani called on the President and his son at Bilawal House, Lahore, where he was appointed head of the newly constituted PPP parliamentary board. Sources said during the meeting, Gilani took the party leadership into confidence about his application against being barred from elections for five years in the Supreme Court (SC). Talking to journalists following the meeting, Gilani expressed hope that his disqualification would be overturned by the SC, allowing him to contest the upcoming polls. Meanwhile, he maintained the demand for carving out two new provinces from Punjab was ‘impractical’. He accused PML-N of not wanting to end the deprivation of the people of South Punjab.